As we come into the beginning of the holiday season, we are reminded of the sacrifices made by our service men and women every day. For soldiers of today and yesterday, the holidays were a reminder of their loved ones back home and the traditions they have here on the Homefront. It is also during this season that we remember all the men and women who have paid the ultimate sacrifice to protect our country. On December 11, 2015 at 6pm we will open the gates of the National D-Day Memorial for free admission to begin our weekend luminary event. Like every year, we are lighting 4,413 luminaries – one to represent each of the soldiers who were killed in action on June 6, 1944. These luminaries will be lit in honor of servicemen, like Captain Ettore V. Zappacosta. He was born in Philadelphia, Pennsylvania in 1915. Although there is not much about his early years, it seems as if he moved to Washington D.C. to live with the Rabil family in 1940, just before the U.S. became involved in the war. 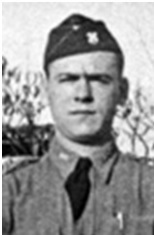 He was the Captain of Company B of the 116thRegiment of the 29th Division of the U.S. Army during World War II. His company loaded from Weymouth-Portland to head towards Omaha Beach on June 6, 1944 on his transport, the Empire Javelin. Not only did Zappacosta valiantly lead his men into battle in the wake of the devastation on Omaha Beach with Company A, his ultimate sacrifice led to freedom for France, Europe, and the rest of the world. Zappacosta is buried in Yeadon, Pennsylvania at Holy Cross Cemetery.